There is an emotional and perceptual clarity and balance to Deborah Butterfield’s sculpture, which emerges from a lifelong, single-minded concentration on the horse as subject matter. In her current exhibition, Butterfield continues to demonstrate her uncanny ability to observe and capture the equine spirit. Beyond its keenly depicted realism there lies a profound relationship between artist and animal. A work by Butterfield strikes us in both look and gesture as absolutely true to our notions of a horse and becomes something fresh and powerful, as well as tender and vulnerable. In several of the sculptures, Butterfield has incorporated debris from the 2011 Japanese tsunami. As she describes it, I have been collecting driftwood and assorted debris all my life, finding beauty and order in the disorder and disintegration of our treasured or discarded everyday objects. Working with the Gulf of Alaska keepers from remote islands in Alaska, I recently had the opportunity to collect a variety of marine debris. Having used colored plastic forms in my horses from similar sources gathered in Iceland and Hawaii, I jumped at this opportunity to use such emotionally, spiritually and tragically infused material. Two other sculptures which also evince a similar sense of loss and poignancy are Blaze and Millie Fire, whose original burnt wood elements were collected from a massive forest fire near the artist’s ranch in Montana. Deborah Butterfield first created sculpture in the form of a horse in the 1970’s using mud, clay and sticks. In 1979, she began using scrap metal and found steel to create her work. 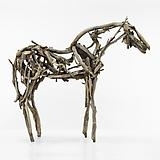 For more than two decades, while continuing to use found metal, she also began casting her sculptures from “stray, downed pieces of wood.” Butterfield carefully, intuitively, selects the branches and sticks which are used to "draw" her horses. The lines of the branches do not simply outline the forms of horses, they create contours through an accumulation of simple or energetic lines that seem to build up from within. This is three-dimensional gesture drawing, and the result is both skeletal and muscular. Like a good drawing, they convey movement, weight, energy and volume. These models or “ghosts” (as the artist refers to them) are then cast, burning the wood away with molten bronze, creating one, unique sculpture to which she then methodically, expertly applies her patina. Butterfield rejects the role of the horse as a mere prop in a human narrative. In terms of art history, she shares more with Chinese art, particularly as it began to coalesce in the Tang dynasty (A.D. 618-907) than with Western art. Unlike the West’s recurring representation of the horse as a subservient creature, as a pedestal for humans and as a tool of war, the Tang extolled the horse as a free, proud, and noble creature. Her work stands as a consummate portrayal of the world's most durable, most mystical, most consistently recorded animal. From the prehistoric caves of Altamira and Lascaux, through ancient Chinese art, the Renaissance, and centuries of English and French artists (Stubbs and Muybridge, Gericault and Delacroix, Degas and Lautrec), Butterfield, along with Frederic Remington and Charles Russell, is one of few Americans to successfully interpret the horse ethos. Distinct from these other artists, however, is the sheer monumental scale of her sculpture. Larger than life-sized, the sculptures project imposing physical presence and emotional content communicated through gesture and stance. They are contemplative, self-contained creatures, like equine versions of the isolated, expressive humans sculpted by Giacometti. 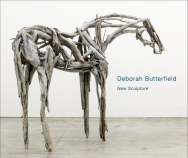 Born and raised in San Diego, Deborah Butterfield received her BA and MFA from the University of California, Davis. From the mid-1970s through the mid-1980s, she taught sculpture at the University of Wisconsin, Madison and at Montana State University, Bozeman. 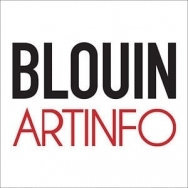 Since 1976, she has exhibited extensively with solo shows at the Seattle Art Museum; Dallas Museum of Fine Arts; The Israel Museum, Jerusalem; Lowe Art Museum, University of Miami, Coral Gables; Madison Art Center, WI; San Diego Museum of Art, CA; Yellowstone Art Museum, Billings, MT; The Contemporary Art Museum, Honolulu. HI; Neuberger Museum of Art, Purchase, NY; Norton Museum of Art, West Palm Beach, FL; Tucson Museum of Art, AZ; and Grounds for Sculpture, Hamilton, NJ, among others. Butterfield’s work is included in numerous public collections including the Art Institute of Chicago; The Brooklyn Museum; Chrysler Museum, Norfolk, VA; Cincinnati Museum; Dallas Museum of Art; Hirshhorn Museum and Sculpture Garden, Washington, DC; The Metropolitan Museum of Art, New York; Nelson-Atkins Museum of Art, Kansas City, MO; San Francisco Museum of Modern Art; Walker Sculpture Garden, Minneapolis, MN; and the Whitney Museum of American Art, New York. A fully illustrated catalogue accompanies the exhibition. For further information please contact the gallery at 212-223-2227 or contact@danese.com. Yau, John. “Introduction,” Deborah Butterfield: New Work. New York: Danese, 2011. Clemans, Gayle. “Deborah Butterfield’s Contemplative horses.” The Seattle Times. July 2011. Esplund, Lance. “Soaring Heights, A Sense of Horses,” The Wall Street Journal, Sept. 17, 2011. A hard copy is available to purchase on Amazon.